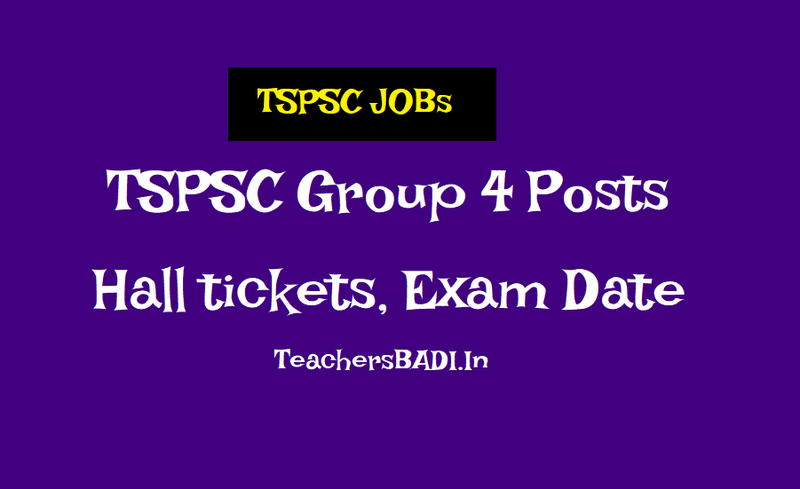 TSPSC Group 4 posts Final Anwer key, Results 2018 /TSPSC Group 4 posts 2018 Recruitment Hall tickets, Exam date: TSPSC Group 4 posts 2018 Recruitment, Apply Online upto July 6, TSPSC Group 4 LD/Junior Steno, Typist, Junior Assistant posts Recruitment 2018: TSPSC has given Group 4 LD/Junior Steno, Typist, Junior Assistant posts posts 2018 recruitment notification and Applications are invited Online from qualified candidates through the proforma Application to be made available on Commission’s WEBSITE (www.tspsc.gov.in) to the post of Group 4 LD/Junior Steno, Typist, Junior Assistant posts(Group-IV Services) in Various Departments in the state of Telangana, TSPSC Group 4 Online application form, How to apply for TSPSC Group 4 Recruitment, Last date to apply for Group 4, Application fee, Eligibility Criteria, Group 4 Hall tickets download date, Group 4 Results date and more details are time to time available at tspsc website. TSPSC Group 4, Panchayat Raj Final Answer Keys are released on tspsc.gov.in. Telangana State Public Service Commission, TSPSC successfully conducted the TSPSC Group 4 Examination 2018 today. The examination was conducted for 1521 recruitments against the notification no. 10/2018, Dt.02/06/2018. The examination is for recruitment of Junior Assistant, Steno and Typist positions in various departments including Panchayat Raj, Revenue Department, Home Department, etc. Final Answer Keys are released on tspsc.gov.in. Candidates who qualify the examination ould be called for verification of certificates. As per the official notification, minimum qualifying marks for Selection are for OCs 40%, BCs 35% SCs and STs 30%. Candidates would also be required to undergo a proficiency test. This test, however, is only for checking the capability of the candidates and the marks of the proficiency test would not be considered. TSPSC has released the TSPSC Group 4 Final Answer Keys on December 14. TSPSC Group 4 Final Answer Keys released @ tspsc.gov.in: The Telangana State Public Service Commission (TSPSC), has released the Final Answer Key for the TSPSC Group 4 examination on the official website of the TSPSC - tspsc.gov.in. The candidates who have appeared for the TSPSC Group 4 recruitment examination are advised to visit the official website to check and download the Final Answer Key. The TSPSC had conducted the TSPSC Group 4 examination on October 7, 2018. The TSPSC Group 4 examination was held to fill a total of 1,867 vacancies. The selected candidates will be posted in various departments such as Bill Collector, Revenue Department, Home Department, Junior Assistant, etc. The candidates, who have applied for the above Notifications that they can download their Hall Tickets from Commission’s Official Website www.tspsc.gov.in from 02/10/2018 onwards. The Hall Ticket may be preserved carefully for future need. Candidates may note that the exam is common for the posts mentioned above. That is a Candidate will be considered for the posts for which he has filled separate individual applications but the examination is common. TSPSC Group 4 Hall Tickets 2018: The Telangana State Public Service Commission (TSPSC), has released the admit card/hall ticket for the TSPSC Group 4 and other posts on the official website of the TSPSC - tspsc.gov.in. The candidates who have applied for the TSPSC Group 4 recruitment examination are advised to visit the official website to download their hall ticket. TSPSC Group 4 Exam 2018 is scheduled to be held on October 7, 2018. Step 6: Take a prin the Hall ticket, Hall Ticket may be preserved carefully for future need. The Telangana State Public Service Commission (TSPSC) has added 74 vacancies to the general recruitment notification in Group-IV services in various departments. Of the total, 44 vacancies were in the Stamps and Registration department and 30 in the Scheduled Caste Development department. The TPSC issued an addendum to its earlier Group-IV notification including the said vacancies. With this, general recruitment will be done to a total of 1,595 vacancies in Group-IV Services. TPSC officials said the candidates who have already applied for the Group-IV services notification would be also considered for the newly added vacancies. 1. తెలంగాణ పబ్లిక్ సర్వీస్ కమిషన్(టీఎస్‌పీఎస్సీ) ప్రకటించిన గ్రూప్-4 నోటిఫికేషన్‌కు సంబంధించి మరిన్ని పోస్టులను చేరుస్తూ టీఎస్‌పీఎస్సీ కార్యదర్శి మంగళవారం నోటిఫికేషన్ విడుదలచేశారు. 2. జూన్ రెండో తేదీన విడుదలచేసిన గ్రూప్-4 నోటిఫికేషన్ (10/2018)లో పేర్కొన్న వివిధ శాఖల్లోని పోస్టులకు అదనంగా 74 పోస్టులను చేర్చుతున్నట్టు అందు లో పేర్కొన్నారు. 4. షెడ్యూల్ కులాల అభివృద్ధిశాఖకు సం బంధించిన 33 పోస్టులు ఉన్నట్టు తెలిపారు. 5. గతంలో గ్రూప్-4 నోటిఫికేషన్‌కు అనుగుణంగా దరఖాస్తు చేసుకున్న అభ్యర్థులందరూ ఈ పోస్టులకు కూడా అర్హులేనని స్పష్టంచేశారు. పూర్తి వివరాలకోసం టీఎస్‌పీఎస్సీ వెబ్‌సైట్ wwwtspsc govin లో చూడవచ్చని తెలిపారు. (Edit Option may be exercised only to correct if any mistake is made) The candidates who have applied for the Group 4 are hereby informed that in recent recruitments it is observed that, the candidates are often committing mistakes in filling Bio data in their respective applications and requesting TSPSC for Bio data corrections in their respective PDF applications. But it is not feasible for TSPSC to make corrections in candidate’s respective applications, as it is the candidate’s responsibility to fill the application form correctly. The candidates to correct their wrongly entered data by way of giving Edit Option. Commission decided to give one chance to the candidates to correct their wrongly entered data in PDF application as a special case. In this regard, the candidates are directed to go through the following instructions. Candidates are strictly informed that this Edit Option may be exercised only to correct if any mistake is made. No further opportunity will be available as Hall Tickets download service has to be activated and there will be no scope at all for any correction after 16/08/2018. Edit option may be exercised with utmost caution. They should check their details and click “submit” button only after ensuring that all the information was filled in correctly. Once submit button is clicked further changes are not allowed. Hence, the candidate should show utmost care while using Edit Option as this Data will be considered up to declaration of results. Post Code Name of the Post Department No. of Vacancies Age as on 01/07/2018 Min. Max. of Pay Scale Rs. i) Must hold a Bachelors Degree of any University in India established or incorporated by OR under a Central Act, State Act OR Provisional Act OR an Institution recognized by the University Grants Commission OR any equivalent qualification. iii) Must have passed the Government Technical Examination in Short hand by the higher grade in the relevant language. If however persons who have passed the examination in Typewriting OR Shorthand by the higher grade are not available those who have passed theexamination by the lower grade may be appointed. NOTE(1): If sufficient number of candidates with Telugu Typewriting qualification are not available for the appointment as Typists candidates with English Type writing qualification may be appointed subject to the condition that he/she should acquire Telugu Typewriting qualification within the period of probation on pain ofpostponement of increment without cumulative effect. TSPSC Group 4 posts 2018 Hall tickets can be downloaded 07 days before commencement of Examination. The Examination (Objective Type) is likely to be held on 07/10/2018 FN& AN. The Commission reserves the right to conduct the Examination either COMPUTER BASED RECRUITMENT TEST (CBRT) or OFFLINE OMR based Examination of objective type.